As a top prize winner, Morgan has been awarded fifteen concerto engagements since 2015; performing the Debussy Dances with the U.S. Navy, Mozart’s Flute and Harp Concerto with members of the Philadelphia Orchestra, and Handel’s Concerto in B flat Major with the North Carolina Symphony (2019), Fayetteville Symphony, the Delta Symphony, Liberty University Symphony and the Roanoke Youth Symphony. Additionally, as Guest Artist for the Shenandoah Valley Bach Festival 25th Anniversary, Ms. Short performed Ravel’s Introduction and Allegro and Mozart’s Flute and Harp Concerto with flutist, Emma Resmini (Juilliard) in 2017. Also, as a featured artist for UNCSA’s Summer Harp Festival, she performed a Solo Concert in 2017. Recently, in the summer of 2018, Morgan competed at the Eastern Music Festival with 74 contestants and was awarded her tenth concerto, Pierne’s Concertstuck which she performed in July. A few days later she became the 2018 Grand Prize Winner and Audience Prize recipient in the Rosen-Schaffel Competition for Young and Emerging Artist’s and will be performing the Debussy Danses with the Eastern Music Festival and the Appalachian Summer Music Festival under the baton of Gerard Schwarz in 2019! Lastly, as the Grand Prize Winner of the Mary Graham Lasley Award in 2019, Morgan will perform Rodrigo’s Concierto de Aranjuez in two December performances with the Alexandria Symphony under the baton of James Ross. An avid competitor, Ms. Short recently won the Grand Prize for the Classics Alive Young Artists National Management Audition in Los Angeles. Winners are selected based on exceptional musicianship, technique, ability to communicate as a performer, and future potential. The competition is open to piano, strings, woodwinds, brass, guitar, and harp as well as small ensembles. The Grand Prize includes an Artist Management contract of two to four years, membership on the roster of Classics Alive Artists, a cash prize of $1000, and several performance and recital opportunities, including a solo concerto performance with the Boulder Chamber Orchestra and a solo recital on the Classics Alive Presents Concert Series. In 2019, Morgan will perform Caplet’s “Masque of the Red Death” with UNCSA faculty and the Chrysalis Chamber Music Institute (Graduate Performance Program) in a touring residency for four performances. Notable performance venues include Carnegie Hall as Principal Harpist with Virginia Tech’s Symphonic Wind Ensemble at age 15, and Galeri Caernarfon (Wales, UK) as well as the Mora Ferenc Museum, (Szeged, Hungary) for three international harp competitions, where she performed in a harp documentary which aired on Hungarian Duna TV. 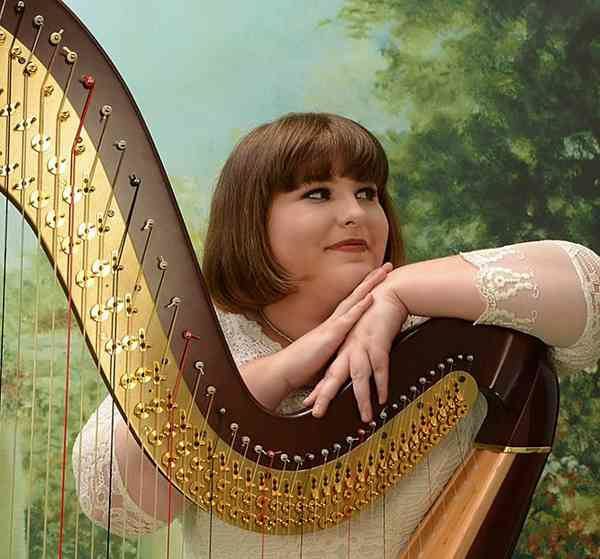 She has also been a featured performer at Arthur Zankel Music Hall, Saratoga Springs, NY for a prominent summer harp festival (Saratoga Harp Colony), broadcast and archived on the Livestream App in 2014 and 2015. Alex and Sheila Ewing Scholar, Orchestra Merit Scholar, and Campus Arts Scholar (2017-2018).